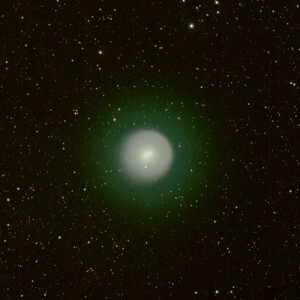 Coma around Comet 17P/Holmes, 2007/11/02. From http://en.wikipedia.org/wiki/Coma_%28cometary%29#mediaviewer/File:17P-Holmes_Auvergne_2007_11_02.jpg. Interesting talk today from Dr. Gorden Videen of the Army Research Lab. Dr Videen is an expert in the interaction of aerosols with light, particularly in their scattering and polarization properties. Scattering of light by aerosols is something most people are familiar: if you’ve ever walked around your house shortly after sunrise, you have probably noticed dust motes drifting through your house. The motes seem to disappear later in the day. What’s happened is that, as the sun climbs into the sky, the angle at which sunlight strikes the Earth’s surface increases, and the light scattering properties of dust render it less visible. Dr. Videen uses the basic principles to glean knowledge about a variety of aerosol particles, from spores to volcanic eruptions. Dr. Videen talked at length about his studies of cometary dust. 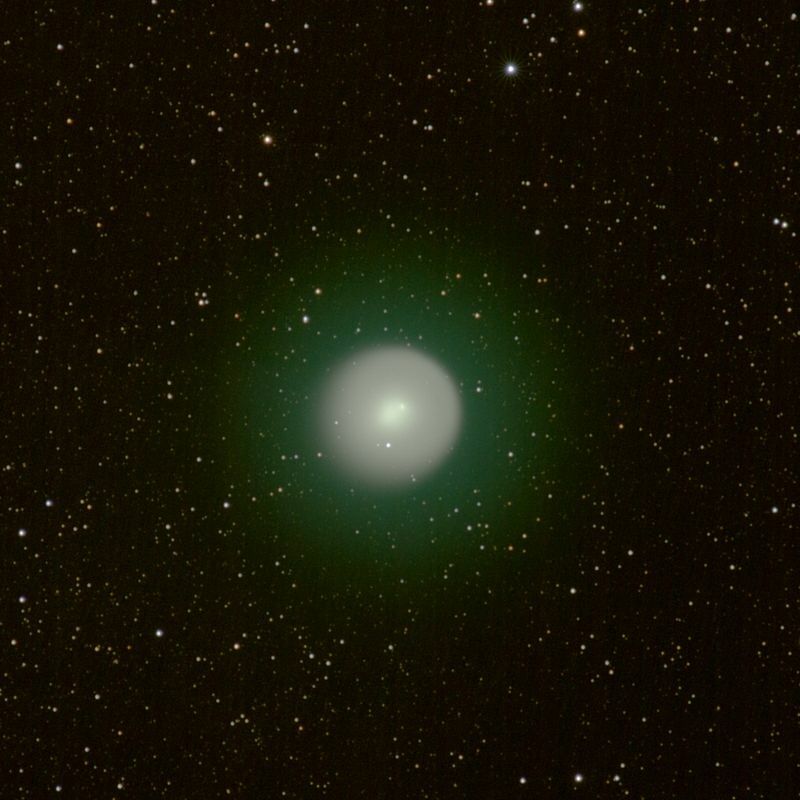 For example, observations of comets like Comet Holmes have suggested that the sizes of particles released from the comet as its gas jets erupt can evolve over time, reflecting the interactions between the jets and particles. Thus, we can use the same physics that shows you how dusty your house is to study gaseous explosions on comets. 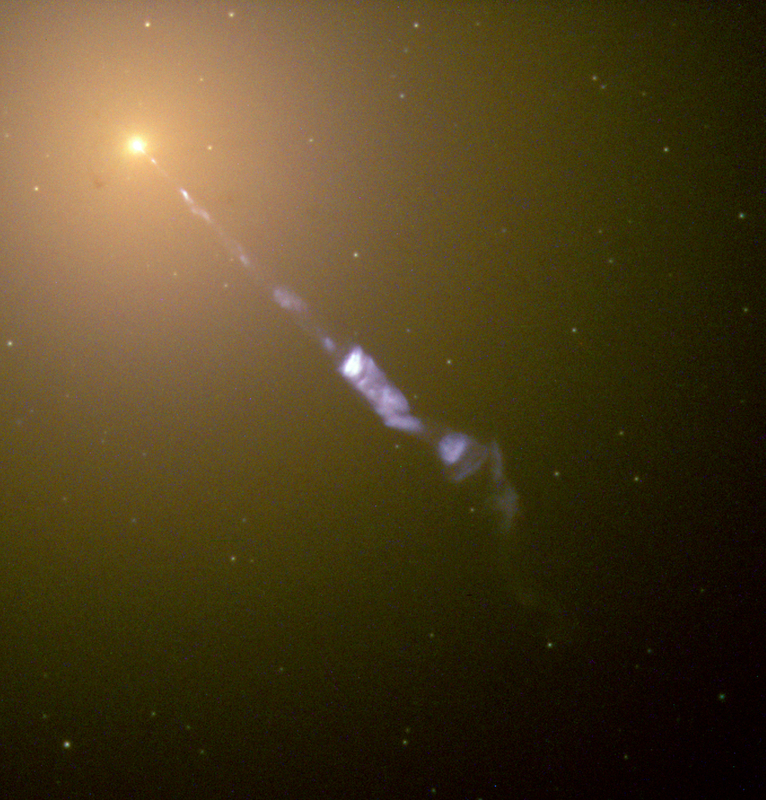 Hubble Space Telescope image of a 5000-light-year-long (1.5-kiloparsec-long) jet being ejected from the active nucleus of the active galaxy M87. From http://en.wikipedia.org/wiki/Active_galactic_nucleus. Great talk today from Dr. Eileen Meyer of Space Telescope Science Institute (STScI) about gaseous jets launched from active galactic nuclei AGN. These cosmic monsters emit a lot of matter and energy, sometimes in the form of jets (see picture at left) that can outshine the rest of the host galaxy. The jets can be observed to span vast distances, thousands of light years, larger than the host galaxies themselves, and mounting evidence suggests that the jets are powered by supermassive blackholes, living deep within the galaxy. Meyer studies the evolution of these jets, and by following the motions of individual clouds of gas, she can tease out their velocity vectors, critical for understanding the amount of energy and momentum carried by the jets. In some cases, she’s found that the jets can brighten or fade over just a few years, some of the few astronomical objects that can be observed to change appreciably on human timescales. Understanding the detailed properties of these jets is critical because they are so powerful they can shape the growth of galaxies and even in the evolution of the Universe itself over the largest spatial and temporal scales. 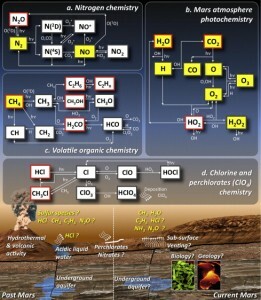 Possible processes and chemical reactions in the martian atmosphere. From Villanueva et al. (2013 — http://www.sciencedirect.com/science/article/pii/S0019103512004599). Great talk today from Dr. Gerónimo Villanueva from NASA Goddard Space Flight Center on organics on Mars. Villanueva was on the team that reported discovery of methane in the atmosphere of Mars. This discovery is important because methane is thought not to stick around too long on Mars (< 300 years), and so something has to actively produce it for methane to be there now, such as microbial life. Detecting methane on Mars is difficult from telescopes on the ground on Earth because the Earth’s atmosphere also has a lot of methane in it. In order to see the Martian methane, Villanueva has to do a lot of observing and modeling to rescue the tiny spectral signal of Martian methane from underneaththe whopping terrestrial signal. According to Villanueva, current observations suggest that, if methane is released into the Martian atmosphere, it is released rarely and not seasonally. 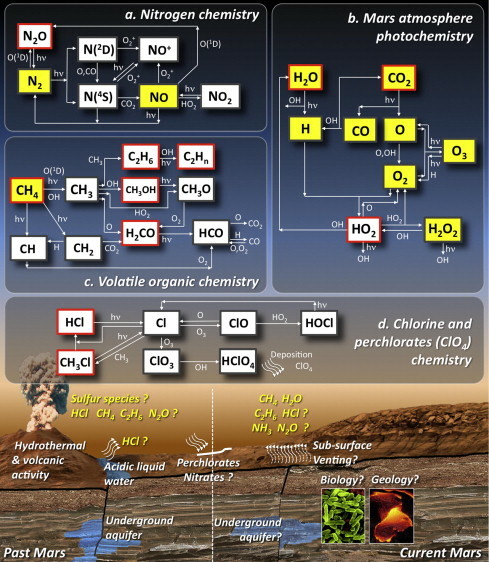 In his most recent work, Villanueva did not detect any methane, possibly indicating that methane has an even shorter lifetime in the Martian atmosphere than previously thought. And so work continues to understand this puzzling but tantalizing discovery. 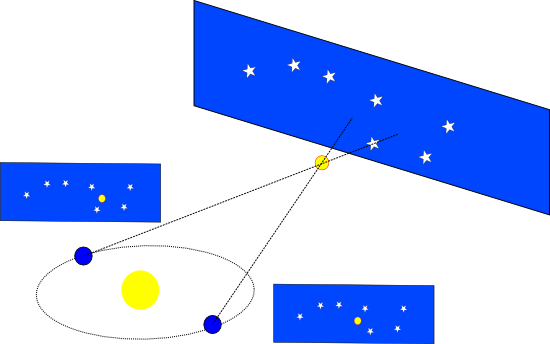 Observing stellar parallax. From http://en.wikipedia.org/wiki/File:ParallaxeV2.png. Dr. Jennifer Bartlett of the US Naval Observatory visited today to talk about her work measuring parallaxes for the stars closest to us in space. Dr. Bartlett spoke about her collaboration’s, RECONS, discovery of several low-mass binary star systems. 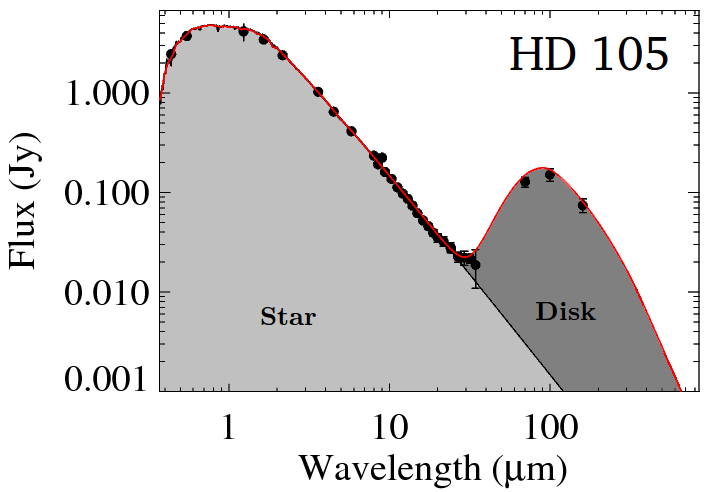 Since the least massive stars are also the dimmest, these systems are some of the most interesting but difficult to study. 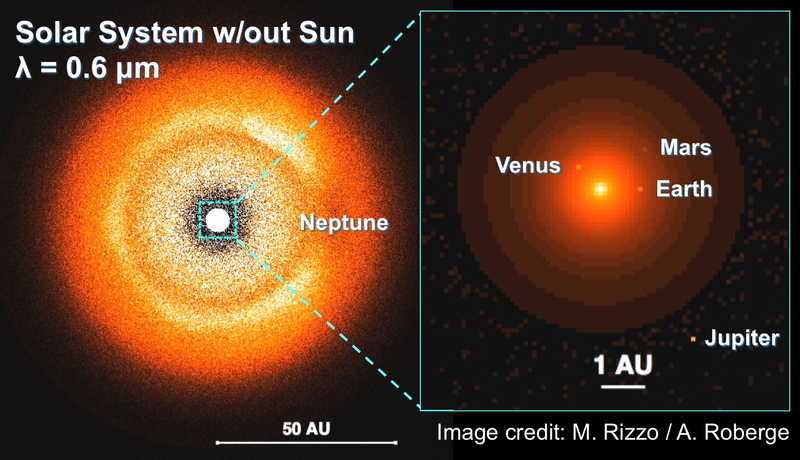 However, these stars can also be the easiest to found extrasolar planets around since the perturbations astronomers look for to find planets are enhanced for these stars, due to their low masses and sizes. But we can only really study these systems if they are close to us. 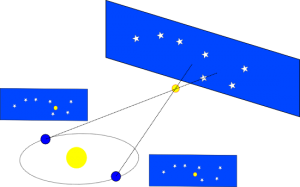 So, for several reasons, measuring the parallaxes to infer the distances to the nearest stars in the galaxy is an exciting topic. Dr. Andrea Banzatti of the Space Telescope Science Institute visited today and talked about observing infrared (IR) light emitted by water vapor in protoplanetary disks. 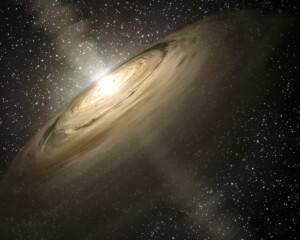 Artist illustration of a protoplanetary disk. From http://www.keckobservatory.org/index.php/gallery/detail/milky_way/32. Planets like the Earth are born in these protoplanetary disks, the gas and dust leftover after a star forms, and by analyzing IR light, Banzatti can estimate how much water there is in a disk and how hot it is. Water is a key ingredient in planet formation, especially for gas giants like Jupiter, and of course, a key requirement for life. So by learning about how much water is in disks, Banzatti is helping us understanding the earliest stages in planet formation and the origins of life. 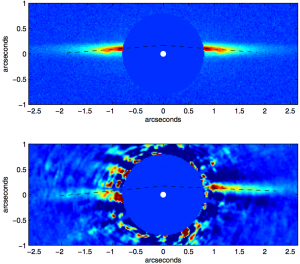 Banzatti developed a new technique to study the temperature and abundance of water in disks, and his results suggest that ice grains actually migrate around the disk, in ways that have been expected but not observed. 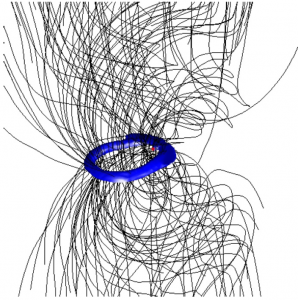 3D view of the inner part of a collapsing gas cloud, forming a star, where a bundle of twisted magnetic field lines is surrounded at the “waist” by a dense ring. The star is shown as a red dot located near the inner edge of the ring. Good talk today from Bo Zhao of UVA Astronomy about the effects of magnetic fields on the formation of binary stars. 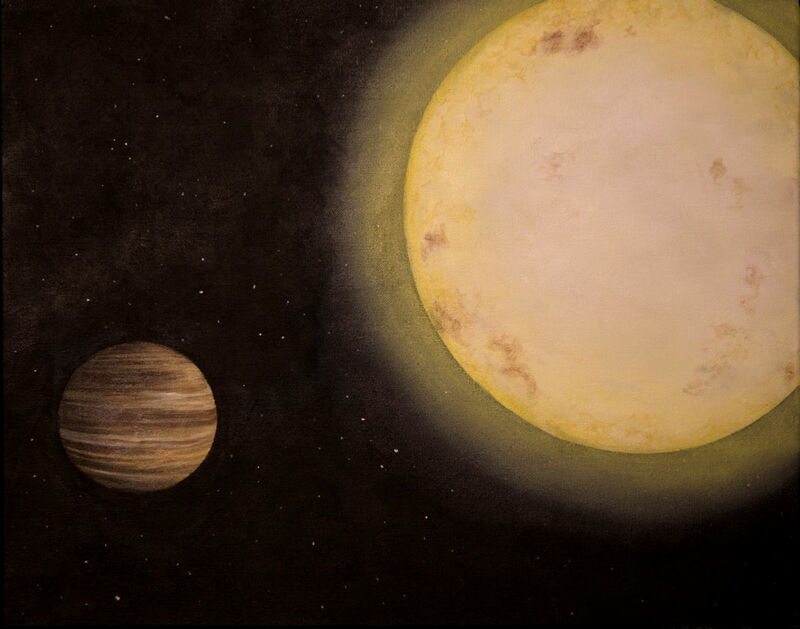 Binary stars are very common, and about half of all stars have such a celestial companion. 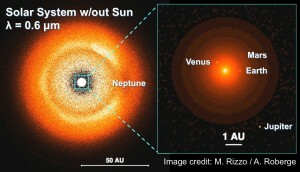 Moreover, several exoplanets have now been found in binary star systems. So the formation of these stars touches on many astronomical topics. Bo described how magnetic fields can control the orbital evolution of binary stars and influence the accretion of mass by the stars. 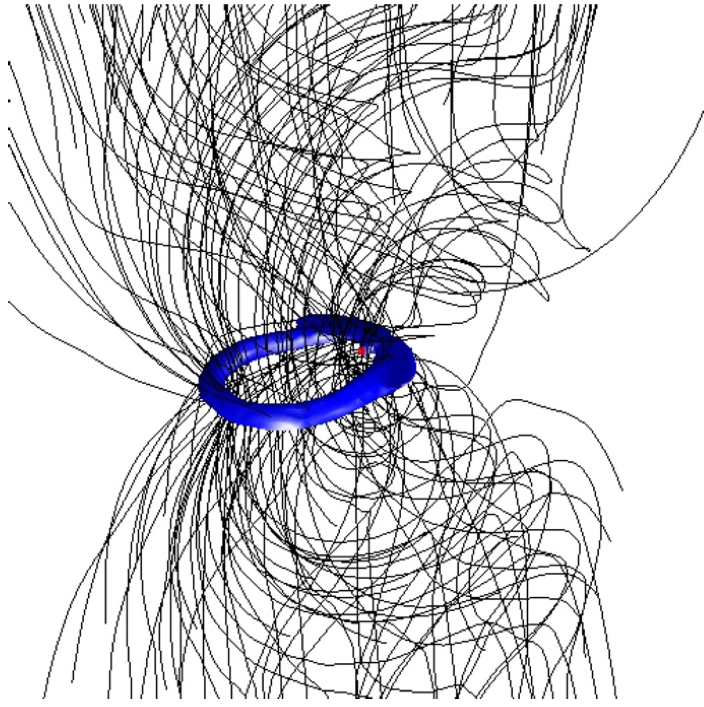 For example, magnetic fields can sculpt the shape of accretion disks around the stars into complex shapes, filaments and strands (as shown at left). 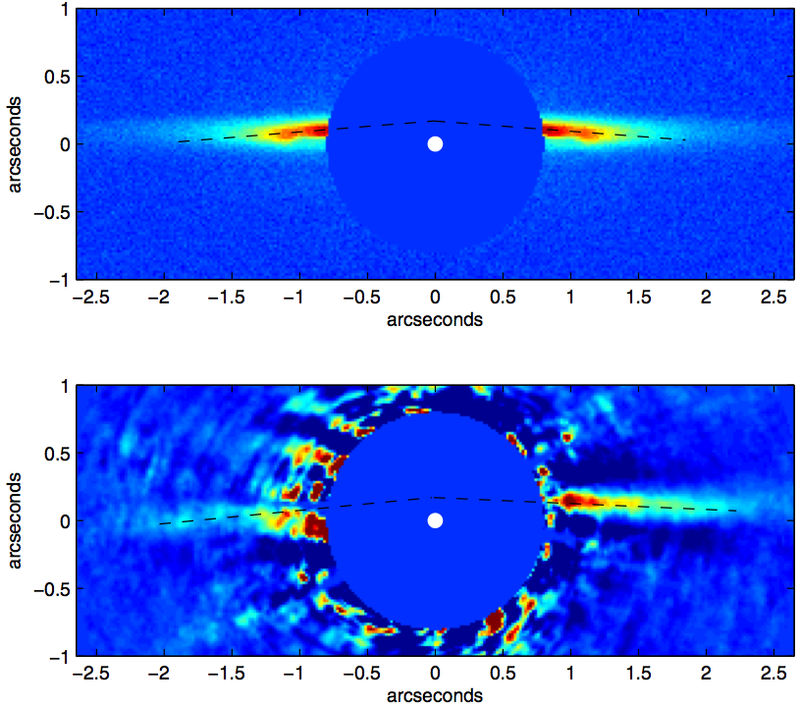 Since these accretion disks mass onto the young stars, understanding their shapes, dynamical evolution, and the effects of magnetic fields on both these are important for understanding the population of binary stars we can see.